The answer is, yes they can. But not in the manner the market thinks. Low oil prices do NOT cause recessions, at least here in the United States. 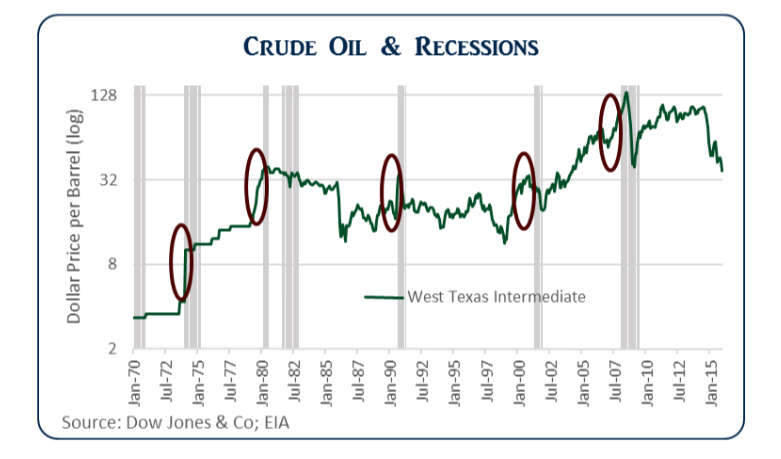 Reference the below chart, which tracks the price of West Texas Intermediate and U.S. recessions since 1970. The price axis is logarithmic. Every recession except one was pre-empted by a spike in oil prices. On average, by the time recession hit, oil had increased 17.6% over the prior twelve months. Notable increases were registered prior to the 2008 (up 41.3%) 1990 (up 31.8%) and 1980 (up 57.2%) recessions. The only time crude oil fell in the twelve months prior to a recession was in the 1981 recession (down 5.6%) and crude was already at historically high levels. The economy was also digesting the tightening monetary policy of Paul Volcker. Low oil prices are a good thing for a service-oriented economy, like that of the U.S. If the historical data doesn’t convince you, take a look at the below chart. This is the non-farm payroll report. Oil & gas extraction jobs account for a mere 1.3% of total employment, and all mining is only 5.4%. Contrast this with the fact that the service sector (including the government) of the U.S. economy accounts for 86% of all employment. Yes, you read that correctly, 86%. So let’s put to rest the argument that the commodity rout is bad for the U.S. economy, and that it is demand-driven. It is a supply glut that will work its way through the system and poses no systemic risks to the banking system. The fall in oil is good for the consumer, and good for corporate profitability. Historically, recessions have followed when input costs spike due to strong oil prices. The oil rout has much more effect on the corporate bond market, than it does on the economy. Energy issuance has most definitely peaked, and there will be energy companies that go under. However, in terms of the overall economy, it will NOT cause the next recession. The next recession will be a function, like it always has been, of tightening credit in the form of a flat to inverted yield curve and the ensuing slowdown of the service sector.